Tawna Werner, Co-Owner, Founder, & President of Elite Volleyball, LLC brings 25 years of playing and coaching experience. She played for perhaps the Best Junior College Volleyball Progam in History, The College of Southern Idaho (CSI), NCAA DI University of Texas - San Antonio, and traveled to Brazil to play Professional Beach Volleyball where her and her partners were very successful. She has coached various levels of volleyball over the years including USA Jr. Olympic and High-Performance athletes. Tawna co-owns and coaches at Elite Club Volleyball. Elite players are recognized as top area volleyball players yearly, with many college level opportunities available to them. As a high school and club coach, Tawna has been responsible for the recruitment of numerous volleyball players to JC, NAIA, and Division 1 universities. Chris Werner, Co-Owner, CFO, & Vice President of Elite Volleyball, LLC, is a former NCAA Division I Assistant Coach with responsibilities of Scouting Opponents, Front & Back Row Defense, & Recruiting from designated states amongst other duties. Chris was also a Head Junior College Coach in which he led the Volleyball Program to its only Winning Season & Best Record in 20 years. He is a USA /CAP certified court and beach coach. Chris brings a unique & vast knowledge of coaching Setters, Middles, & Offensive Strategies from Serve Receive to Transition Defense. Chris is also responsible for the recruitment of High School Club Volleyball Players & Junior College Players receiving Athletic Scholarships to All Levels: DI, DII, DIII, NAIA, & JC. Both Tawna & Chris have coached their Club Teams to an Intermountain Region Record 2nd Place at the USA Volleyball 18's National Division, along w/ two 5th places, one 7th place, and a ninth place. They coached their teams, over the years, to numerous Championship Wins at the USA Volleyball National Qualifiers: Far Westerns & Colorado Crossroads combined with several Top 3 finishes at Pacific Northwest & Southern California National Qualifiers. Every level, every team, every coach. There's a plan for you. Please reach out with any questions by filling this form and we'll get right back to you with the answer. 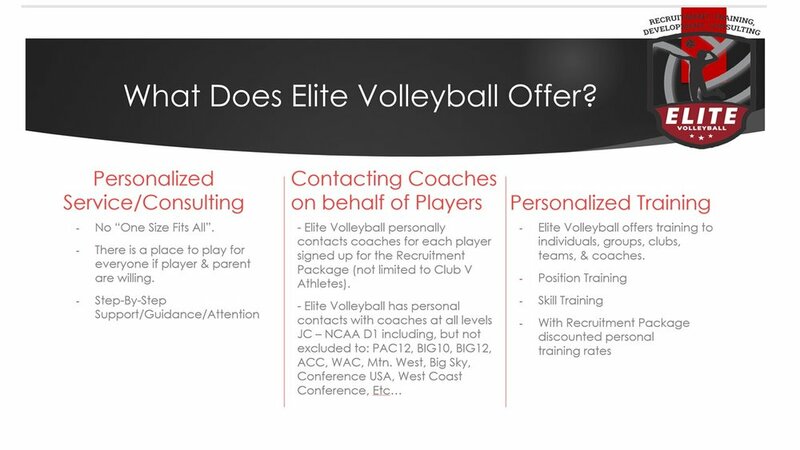 Elite Volleyball accepts Venmo, Cash, Credit Card Payments using Square ($500+ requires inclusion of interest charged by Square), is also open to other types of Digital/Mobile payments. For Credit Card Payments, Please contact as we accept Credit Card Payments on Site or over a Recorded Phone Conversation.